Look, no border! It's just like the Berlin Wall coming down all over again! LG's theme for its TVs at IFA 2009 is 'Live Borderless'. This consumer electronic version of the Schengen Agreement is based on panels without visible borders. Two 'Borderless' Full HD LCD panels, the SL8000 and SL9000, use a new injection compression moulding technique that creates a sleek, uninterrupted glasslike surface. A special sheet of laminate film covers the televisions' front surfaces, eliminating the line between the screen and the bezel while also reducing glare. The result is a uniform, seamless surface from edge-to-edge, with no visible frame. An 'Invisible' speaker, hidden on the bottom of the set, completes the illusion. 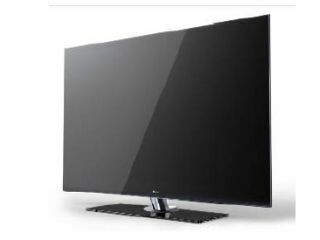 The super-thin (2.9cm) SL9000 has an LED backlight to produce an extremely high dynamic contrast ratio of 3,000,000:1 and LG's TruMotion 100Hz technology for reducing motion trails. Other features include built-in Bluetooth to download content from mobile phones, a USB 2.0 port for digital (JPEG, MP3, MPEG-4 and DivX) files and energy saving modes. The other 'borderless' set, the SL8000, has a traditional backlight giving 150,000:1 contrast ratio, but with 200Hz motion scanning. Elsewhere in LG's IFA TV line-up, the LH9500 is an LED Full HD panel boasting a stonking 5,000,000:1 contrast ratio, thanks to splitting the backlight into 240 separate blocks. It's a wall-mountable beauty, too, with a built-in wireless HD receiver that means you attach all your satellite boxes, consoles and Blu-ray players to a single media box, then hide it up to 30 feet from the TV. The LH9500 itself just needs a single power cord. The LH9000 is very similar - with 5,000,000:1 dynamic contrast ratio and 200Hz motion scanning - but without the integrated wireless HD streaming. Both tellies use LG's Smart Energy Saving Plus to slash energy consumption by 75 per cent compared to "most similarly sized TVs". Prices and availability info will follow in due course.